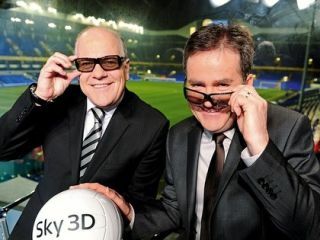 Sport is expected to be a major driver of 3D take-up, why else would Sky have invested so much in to its 3D football matches at numerous UK pubs? Sport events create exactly the kind of buzz that 3D will thrive on. You get to witness all the excitement and tension of an event without having to endure poor weather, extortionate prices and a nightmare journey home. It's not exactly the same as being there – we'll have to wait a few years till holographic 3D arrives for that level of experience – but watching sport in 3D is pretty amazing. However, the technology is young and TV sport producers are still honing their 3D skills. It's also already clear that while 3D really works for some sports, others have not fulfilled their potential and fall a little flat - literally and emotionally. So which sports do we think are made for 3D and which aren't? This is expected to be one of the main attractions stateside beginning with regular weekly college football on ESPN 3D. Sports Illustrated has given 3D football the thumbs up, saying "Watching in 3-D, I saw what the players on the field and the fans sitting directly behind the goalpost had seen that night. The game-winning kick hooked in by mere inches, and just in time. Had it waited another millisecond to turn, it would have hit off the upright." With the cameras in the right place we can feel the pain of the quarterback being jumped on by a linebacker. Hardly the most exciting of events it's nonetheless bound to feature in the 2012 Olympics on the red button. If any cameraman were brave enough to lineup behind the target things might get quite spicy but those arrows are too thin and move too fast to serve up anything meaningful other than a headache. The UK will have whipped itself up in to a running frenzy by the time August 2012 arrives along with a rather important 'meet' in east London. The BBC has said it will film a lot of the Olympics in 3D. Those wonderful 110m hurdles side-tracking shots won't come off as 3D doesn't look so good side-on but we reckon there should be some corking moments such as Usain Bolt's knees thrusting into your sitting room or Phillips Idowu spring-boarding through the screen to end up in your lap. You might find yourself reaching down to pick up the baton that's landed at your toes after a disastrous relay hand-over. Another sport that's a sure-fire winner for American networks. Plenty of scope for the diamond to cut its way into your living room and you'll wince as the camera shows the catcher's POV as the bat swings back or the ball hurtles towards you. Bound to offer some great crowd shots too when a home run fires in to the bleachers. Sports Illustrated's Andy Staples says that 3-D makes it feel as if you're stood on the court during a game. He recalls "When Globetrotter Kevin Daley jabbed his index finger as he addressed the crowd, I jumped out of the way to avoid getting poked." Players tussling might not add much but the big ball is ideal for 3D and should guarantee some wonderful aerial shots. Imagine sparring with Floyd Mayweather in your own living room without suffering any resultant bruises from the inevitable pounding. 3D boxing can't quite deliver that but as early Sky experiments have shown you get to really enjoy a virtual ringside experience as every punch, duck and swerve swoop through the screen. You may even need a brolly as a blood and sweat shield. Britain's most sedate sport is strangely compelling in 2D and a natural for 3D given that the cameras are naturally positioned at either end of the green. Side-on shots of the bowlers on bended knee won't offer much though. Sky will be showing its first live cricket match soon on its 3D channel. It'll be an interesting experiment as the sport is well suited to 3D with its natural viewpoint over the bowler's arm. Some of the wider shots might fall a bit flat but a lot of the pleasure in watching cricket comes from the slow-motion close-ups of great batting, bowling and fielding and these should all deliver the 3D goods with ease. Following pedaling maniacs across the Alps could produce all sorts of weird effects - quick moving cameras are bad news for 3D but velodrome action could work well. The sight of Chris Hoy, Bradley Wiggins and co sweeping round the bends, coming out of the screen and then deep in to it will be as effective as the side-view of the finishing line will look dead flat. For atmosphere you'd be hard pressed to beat the experience of sitting in the crowd at the Lakeside. As you'd discover, it's not about the view, it's the frenzy. A 3D view behind Phil 'the Power' Taylor's elbow on the oché would be fun, and the dartboard close-up would be just like being in the pub. Ever wanted to stand behind Tiger Woods teeing off at St Andrew's or whisper in Lee Westwood's ear as he putts the winning shot at the Ryder Cup? We reckon the 3D experience would be highly effective, probably not any better at seeing a driven ball when the camera tilts and pans but it would transport you to some of the most beautiful sporting scenery on the planet. If ever there was a sport that screamed 3D it has to be gymnastics. The various disciplines - floor, pommel horse, rings, vault, parallel bars and high bar - all require graceful, co-ordinated movement in three dimensions. Somersaulting, twisting and leaping on the floor could look especially amazing but the cameras would have to be careful not to move quickly. And no zooming - that is a headache waiting to happen. Despite being the fans' favourite in boozers across the land, football is not the perfect 3D fit you might have been led to believe it is. The natural side-on view doesn't add much extra depth. Matters improve when the camera is placed behind the goal in terms of seeing the players but strangely the most compelling shots seem to be of the crowd. As with all sports where the onscreen logo and score banner are placed has a strong influence on the depth of the image and these can be highly distracting when they stick out too much. Sky is working on it.